The project focussed on the broad issue of educational services for people with vision impairment in East Timor. Through the establishment of links with the Australian East Timor Eye Care (ETEP) team, the author participated in the eye care program in the districts of Aileu and Dili. Through the process of discussion with government officials, educators, village chiefs, church leaders, aid workers and people with vision impairment and their families, demographic information was compiled and an educational model formulated. At the present time there are no comprehensive prevalence data on people who are blind or vision impaired in East Timor. A national survey by TimorAid of six districts has identified 646 children with disabilities, 53 of whom (8.2%) have vision impairment. Population data for the areas surveyed are not available at this time. The major causes of inoperable blindness were identified as Vitamin A deficiency and eye trauma. The ETEP team identified the eye conditions of cataract, glaucoma, strabismus, nystagmus, photophobia, myopia, hypermetropia and watery eyes in the Dili and Aileu Districts. In the Dili District, two youth with vision impairment attend Taibessi School for Disabled. Ten students with vision impairment attend the newly formed national non-government organization, Fuan Nabilan Ba Matan Aat. In the districts outside Dili, children who are blind do not attend school and are illiterate. Only one child with low vision was identified as attending his local school. He has been unable to acquire literacy due to the severity of his eye condition and the absence of specialised educational services and resources. Identification of a national or international organization that could coordinate the development of educational services for people with vision impairment, including management of the flow of information and resources and placement of trained personnel in districts. Early identification of children with vision impairment and referral by (a) the Australian ETEP team (biannual, two-week visits), (b) government district health and educational administrators and school principals, (c) church and community organizations, and (d) medical providers. Establishment of community-based education services through collaboration with existing community networks, for example religious orders or UNICEF youth centre network. Placement of disability-specific trained facilitators within districts. 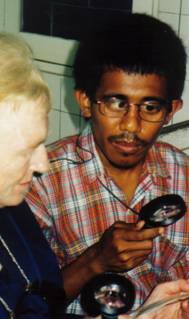 Volunteers fromorganizations such as Australian Volunteer International (AVI) could be provided with specialist training from international foundations or associations for the blind, including training in braille literacy and numeracy, literacy in dual print media, orientation and mobility and technology. Capacity building and community participation in the provision of educational services, for example through the establishment of "community motivators" or "volunteer disability mobilizes". In Dili District: Provision of special education services by Fuan Nabilan Ba Matan Aat and Taibessi School for Disabled. The establishment of linkages with regular schools in the Dili district would enhance inclusive education options for students, plus human and physical resource support networks. Use of Portuguese braille code (Grade 1) for reading and writing material in Tetun, Portuguese and Indonesian. Provision of braille production facilities to Fuan Nabilan Ba Matan Aat. The implementation of the above educational model requires the provision of financial, human and physical resources by the international community, in particular the provision of training programs and educational resources, and funding for Fuan Nabilan school infrastructure. National library in Dili and library services in the districts. This report results from its author's visit to East Timor in mid 2002, on behalf of the International Council for the Education of People with Visual Impairment (ICEVI). ICEVI is a professional non-government organization that promotes educational opportunities for children and adults with vision impairment throughout the world. The ICEVI project objectives were to investigate and document the needs of East Timorese people with vision impairment, and to produce a set of recommendations relating to access to appropriate education services. The report provides some background information on educational services in East Timor, including levels of literacy in the general population. The report presents a model for the education of people with vision impairment, supported by an analysis of needs and recommendations for the international and East Timorese communities. are blind or vision impaired, including numbers of children with vision impairment, nature of impairments, specialist teacher and resource provision. * To obtain demographics of people with vision impairment in East Timor. Travel to towns in Aileu district with the East Timor Eye Program (ETEP) team. Accommodation and logistical support provided by the Maryknoll Sisters and Dr Collette Livermore. Needs analysis and work with ETEP team; travel with Fuan Nabilan staff to Manufahi district (3&4 July). Accommodation at the Dili Hospital, and home of Fuan Nabilan staff in Manufahi district. 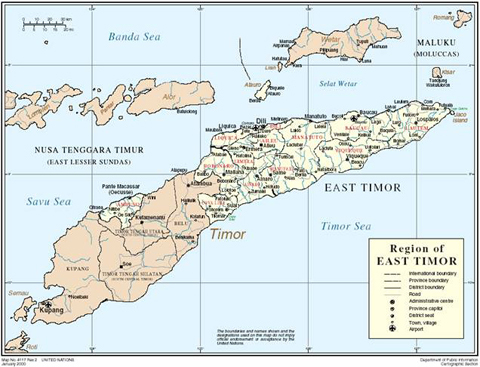 The eastern part of Timor was a Portuguese colony from the 16th century to 1975. During this time Portuguese was the language taught in schools and used within the community. The native language of Tetun was originally spoken on the south coast of Timor. The Portuguese brought a form of Tetun to Dili in the late 18th century. With the Indonesian invasion of East Timor in1975, Portuguese was outlawed and the official language became Bahasa Indonesian. All students attending school between 1975 and 1999 were taught in Indonesian. Following the vote for Independence in August 1999, school buildings, administration records and schools resources across East Timor were destroyed. Indonesian teachers returned to Indonesia and schools were closed for up to twelve months. Towards the end of 2001, an East Timorese non-government organization (NGO) called Fundasaun Fuan Nabilan Ba Matan Aat (Inner Light to the Blind) was established in Dili. It was established in response to the recognised educational needs of children and adults with vision impairment. Fuan Nabilan currently has ten students enrolled from the Dili district. The Independence celebrations of 19th and 20th May involved the official handover government administration from UNTAET (United Nations Transitional Administration of East Timor) to the Republica Democratica de Timor-Leste (Democratic Republic of East Timor). The East Timorese government is addressing the challenging work of developing political, economic, health and education infrastructure and communication systems within its boundaries. With a population of approximately 830,000, 50% of whom are under the age of 20, the development of an effective educational system is of major importance to the government. During the 24 years of Indonesian rule, the education options for youth with vision impairment aged 7-15 years were (a) education at the Taibessi School for Disabled in Dili, or (b) attendance at a school for the blind in Jakarta, Indonesia. Residential facilities enabled some children from other districts to receive an education, however, the majority of children with disabilities outside the Dili district did not receive an education. Current specialist education services in Dili consist of Taibessi School for Disabled, which caters for youth with physical, intellectual or sensory impairment), and Fundasaun Fuan Nabilan Ba Matan Aat, an East Timorese non-government organization established late 2001 to meet the needs of for young people with vision impairment. Each district of East Timor has a government educational administration and primary, junior high and senior high schools. Schools are required to follow government curriculum guidelines. There are no separate curriculum guidelines for students with disabilities. The languages of instruction in all schools are Indonesian, Tetun and Portuguese. English is often taught as a foreign language. There is currently a Portuguese language teacher-training program in all districts, funded by Lisbon through its Camoes Foundation. At the present time, only limited numbers of people can read or write in Portuguese. There are two universities in Dili, one of which is an international university. Approximately 50% of people live below the international poverty line of about $1 per person per day. 46% of adults have never attended school. 49% of the population is illiterate. 65% of women are illiterate. 37% of the population read with difficulty. 53% of school children have no books. The rest have one or two books. The unemployment rate is 70%. Average life expectancy is 57. Two common causes of vision impairment in East Timor are eye trauma and Vitamin A deficiency. Causes of Vitamin A deficiency include poor nutrition and disease resulting in poor absorption of nutrients. Diseases in East Timor include malaria, diphtheria, polio, typhoid and tuberculosis (TB). Parasites such as hookworm (ingestion through bare feet in rice paddies or exposure to urine and saliva on ground surfaces) also effect Vitamin A absorption. Causes of eye trauma include accidents involving the eye, including injuries inflicted by military and militia forces before and after independence in 1999. Timor Aid is an East Timorese non-government organization, funded by local and overseas bodies to conduct a range of programs. Current programs include (a) Literacy program for women, (b) Capacity building for non-government organizations in the area of project management, and (c) Disabled Children project. Funding organizations include the United Nations High Commission for Refugees, World Food Program and US Aid. The Disabled Children Project addresses such areas as identification, awareness- raising, and quality of life improvements. Timor Aid is currently undertaking a national survey to identify children with disabilities in each district. Information is collected under the categories of physical, intellectual and sensory disabilities. Table One below presents data collected on numbers of children with disabilities, and numbers and percentages of this group who have vision impairment. It is noted that not all villages and towns in the six districts have been surveyed, and therefore demographics on total numbers of children with vision impairment in each district or nationally cannot be extrapolated. The East Timor Eye Care Program (ETEP) is a program of interim eye care, provided by a team of eye health professionals who visit East Timor for a two-week period, twice each year. The ETEP team consists of ophthalmologists, optometrists, theatre nurses, anaesthetist, and program logistician. ETEP partners and sponsors include the International Centre for Eyecare Education (ICEE), Laila Foundation, Foresight Australia, Australian Red Cross (Northern Territory Branch), and the World Health Organisation's global initiative Vision 2020: The Right to Sight. One-week outreach program: The ETEP optometrist team village prearranged villages in a district outside Dili, assessing people who present with eye problems. Through the assessment process, spectacles are provided and people requiring eye surgery are identified and referred to the ophthalmic surgical team the following week in Dili. The travel arrangements to Dili Hospital of villages requiring eye surgery are also organised. One-week program at the Dili Hospital. The ETEP optometrists assess Dili residents at the hospital, providing spectacles and making referrals to the ophthalmic surgery team. The ophthalmologic surgery team operate on people identified during the outreach program, plus Dili residents requiring eye surgery. Eye care training program for East Timorese district nurses, coordinated through the government Health Administrators in each district. The total population of the district of Aileu is 36,000. The ETEP team visited a number of villages in Aileu and assessed approximately 400 people. Of this group, approximately 250 people were prescribed spectacles for near and distance vision. Tables two and three below provide information on people whose eye conditions could not be addressed through the prescription of spectacles. Adults (over 18 yrs age) 21 15 Cataract 1 Lid retraction 3 Consultation 1 Glaucoma 1 Pterygium surgery Supra nasal mass interfering with peripheral vision, blindness in one eye. The group of people with inoperable eye conditions and their families received basic orientation and mobility training from the author, with some white canes provided as appropriate. None of this group was literate, and none of the children attended school. The East Timor Eye Care Program team assessed and treated approximately 1150 people over a five-day period at Dili Hospital, including people with the following eye conditions. The author is aware of two young people who are blind attending Taibessi Special School in Dili, and ten young people with vision impairment receiving braille literacy instruction at Fuan Nabilan in Dili. Information on school enrolments of children with low vision is unavailable. One child attending school is six-year-old Fernando, who lives in the District of Aileu. Fernando had polio as a baby and, through the efforts of the Maryknoll Sisters received cataract surgery during childhood, which unfortunately was unsuccessful. Fernando can identify colours, but has insufficient functional vision to access print. He attends his local village school, but is unable to participate in reading and writing activities. The author compiled the following list of needs and issues over the two-week period of the project. It is offered as a starting point to raise awareness of the issues and impediments that must be considered and addressed in the establishment of a model for the provision of educational services for people with vision impairment in East Timor. Need for capacity building in all areas, including health, education, employment, community and family structures and networks. Need for links between international and national communities to plan for the future era of reduced funding, training and resource provision, for example, city-to-city friendship programs, sister school programs. Need for disability awareness programs in districts and villages. In general, communities are accepting of people with disabilities. However, there is no expectation that they will contribute to the economic welfare of families or communities. Need for the development of building standards and disability-related guidelines for the construction of new buildings and restoration of old buildings. Need for networking and coordinated approach to training and resource provision between international and national organizations and agencies. Need for coordinating body to receive and distribute goods arriving from overseas, including the discharging of goods through customs. Current distribution options include: Nominated staff of the East Timor Government Division of Labour and Social Services, Dili; Peace-keeping forces, eg CMU/PKF; Church organizations, eg Maryknoll Sisters, Carmelite Sisters, Silesians, Edmund Rice Communidate (Christian Brothers); and International non-government organizations. Need for development of an East Timorese-based tertiary teacher-training program and increased numbers of certified teachers. Current class sizes of 60 students are not uncommon, with many schools using the "wave system" to manage class sizes ( i.e. student attendance is staggered during the day). Need for specialised curriculum for children with special needs, from early intervention to high school levels. Need for extensive literacy program targeting women. Need to develop sustainable community programs that enhance the economic viability of village communities. Common activities for women include farming, needlecraft and weaving, water cartage (in plastic containers from water sources), domestic chores and cooking. Need for development of health services in all districts, including programs, family planning, and pre- and post-natal care programs. Families of six to eight children are common. Family members often attend births in remote areas, with medical assistance sought only when there are childbirth difficulties. The mortality rate for children under 5 years of age is 159 per 1000 (source Sydney Morning Herald, 18.4.02). Need for nutrition programs, including ways to minimise Vitamin A deficiency. Need for extensive immunization program. At present, only 9% of infants under 12 months of age are immunized against diphtheria, polio and typhoid (source Sydney Morning Herald, 18.4.02). Need to develop adequate transportation mechanisms for the movement of people, goods and produce. The interior of East Timor is mountainous, with rough windy roads in varying states of repair. Villages in the districts are often remote or inaccessible by car or motorbike. Need to develop sustainable phone and power capabilities in all districts. The following education model has been constructed through the process of discussion with government officials, educators, village chiefs, church leaders, aid workers and local people in villages. The successful establishment of educational services for people with vision impairment will require the identification of an organization that will take responsibility for the management and coordination of education service development in each district. In particular, this organization would manage the flow of information and resources, and the placement and support of trained personnel. Assessment and referral by the Australian East Timor Eye Program (ETEP) team. Referral by government district health and education administrators and school principals in towns and villages. Referral through church and community organizations, for example the Maryknoll, Carmelite and Josephite Sisters. Referral by medical providers working in districts. One limiting factor is the shortage of adequate health facilities outside Dili, with the exception of health services provided by religious orders. Early identification of children with vision impairment in remote villages may not occur if the mother does not seek medical support or attend an ETEP clinic in her district. The proposed model supports intensive instruction in disability-specific curriculum in a community-based special setting, followed by inclusive education in the child's local village school. It would be beneficial to build upon existing structures and services in the districts, such as health and vocational programs. This approach would require networking between national and international agencies. Collaboration would minimize capital expenditure and enhance and streamline the provision of services to communities. In some districts, significant community programs and services have been established by religious orders, such as the Maryknoll Sisters of Aileu. Educational programs could be provided through partnerships with such religious orders. In other districts, there currently exists an initiative coordinated by UNICEF, called "Child friendly spaces". This is a youth centre network, with funding and operation by various organizations, for example The Body Shop sponsors a youth centre in Viqueque. Educational and rehabilitation services for people who are vision impaired could operate on "market days" at the youth centres. On market days, people travel from their villages to the main town to sell their produce. It would a feasible day for families to bring their children with vision impairment to the youth centre. Capacity building in East Timor requires the identification of service providers/agencies in the international community who could offer community based rehabilitation and education services. For example, such volunteer organizations as Australian Volunteers International (AVI) could provide trained volunteers to teach disability-specific education and rehabilitation skills to people with vision impairment. Disability-specific training of volunteers would be required by foundations for the blind and educational institutions offering specialist training programs, such as the Royal Victorian Institute for the Blind and Royal Institute for Deaf and Blind Children NSW. The placement of international volunteers with specialist training would be negotiated through the East Timorese government's Division of Social Services, and also through consultation with District Education Administrators, church and community groups. individuals with vision impairment. With independence comes the newly acquired freedom and responsibility of communities, interest groups and individuals to take part in the decision making process at macro and micro levels in society and government. The involvement of communities and individuals in the establishment of education and rehabilitation services for people with vision impairment would enhance the long term success of community-based programs. The Maryknoll Sisters in the district of Aileu have a network of "Community Motivators" who support the Sisters in their provision of health services within the district. Community motivators are volunteers from villages who work within their communities to support the health and well-being of the community. The "community motivators" are trusted and respected members of their communities. The Division of Social Services of the East Timor government has proposed a system of "Volunteer Disability Mobilisers", that is, volunteers from local communities who would receive training in disability related issues. As with the Maryknoll initiative of "Community Motivators", the "Volunteer disability mobilisers" would be empowered to act as advocates for people with disabilities within their local communities, as well as identifying people who need educational and rehabilitation support services. It is recommended that Taibessi Special School and Fuan Nabilan Ba Matan Aat provide educational services for people with vision impairment in the Dili District. Both organizations would benefit from the establishment of formal and informal links with regular schools in the Dili district. Such links would enable the progression of students from special to inclusive education settings, as well as enable the sharing of human and physical resources, educational programs and professional development opportunities. The establishment of a "sister school program" with overseas schools would also enhance the operation of Fuan Nabilan and Taibessi School. Taibessi Special School for Disabled currently provides an educational program for children aged seven to 15 years old who have physical, intellectual or sensory disabilities (blind and deaf). Of the 12 students currently enrolled, two students are blind. School hours are 8.00 am to 10.30 am, then 2.00 pm to 3.30 pm, Monday to Friday. The children return home for lunch periods between 10.30 am and 2 pm. No residential facilities are currently available. Fuan Nabilan Ba Matan Aat is a registered national non-government organization (NGO) that is officially supported by the Education Department. Fuan Nabilan currently offers education services to ten people under the age of 30. Fuan Nabilan requires support with establishment of school premises, training and provision of a vehicle (See Appendix 5). Fuan Nabilan staff also plan to establish a community-based rehabilitation and independent living centre in the town of Same in the district of Manufahi. Negotiations with the government District Administrators for education and health are currently underway. Taibessi Special School and Fuan Nabilan staff require support from the international community in teacher training in the areas of orientation and mobility, braille literacy and numeracy, low vision, optical aids, and itinerant teaching models. With appropriate training, staff at Taibessi Special School and Fuan Nabilan could provide specialised educational support and training to educators and administrators in regular schools in the future. It is recommended that the braille code used for the production of reading material is the Portuguese braille code, Grade 1. 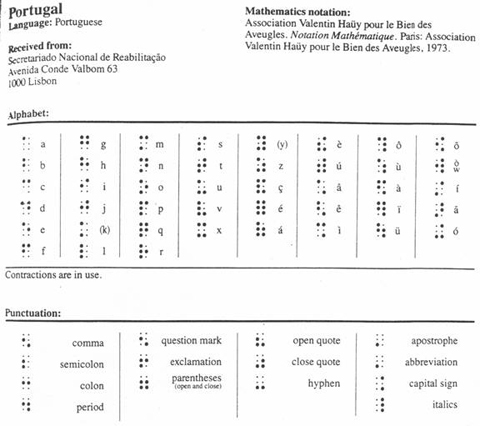 The Portuguese braille code accommodates the linguistic features of written Tetun, the official native language spoken by approximately 80% of people in East Timor. It also accommodates the Indonesian braille system, with the exception of the braille signs for 'ng' and 'ny'. Braille reading material could therefore be produced in Tetun, Portuguese and Indonesian as required. It is recommended that the national NGO, Fuan Nabilan Ba Matan Aat be provided with the technology and training to produce braille materials in East Timor. This capacity building initiative would enable Fuan Nabilan to produce and supply braille reading materials to people with vision impairment in all districts of East Timor. Ongoing international support and maintenance of equipment would be essential. The author is currently negotiating the purchase of braille production technology through Timor Aid, with thanks to Jersey Overseas Aid for the provision of funds. The United Nations Poverty assessment conducted in February 2002 identified an unemployment rate of 70%, with 50% of East Timorese people living below the international poverty line of $1.00 per person per day. A large percentage of the population are subsistence farmers. The illiteracy rate of 49% (and 65% for women) must be addressed if the nation is to meet the challenges of developing the economy, education and health services. Education services for people with vision impairment, in tandem with vocational training, is the key to improving the quality of life and community perception of people with vision impairment. Possible vocational options for people with vision impairment are teaching, farming, handicrafts and community-based therapy services (such as therapeutic massage and herbal remedies). These issues were beyond the scope of this ICEVI project. The following recommendations are submitted for the consideration of the international community. They relate to the educational model proposed, plus the issues and needs identified through the needs analysis process. East Timorese people with vision impairment currently do not have a "voice" at any level of society. They are cared for by families and communities, but are not expected to contribute to at any level of society or receive an education. Fuan Nabilan has gathered together a group of bright young blind adults who are keen to bring about change in East Timor for people with vision impairment. One of the group is literate in Indonesian Braille, having received an education in Indonesia, and others have commenced development of their braille literacy skills. With international support, there is great potential to promote the formation of an East Timorese Association of the Blind. Ongoing commitment to training programs provided by the international community is required to promote capacity building within East Timor, and the development of quality, sustainable educational and rehabilitation services and structures. Training programs should be designed and coordinated by people who are knowledgeable of the customs and needs of the East Timorese people. disability-specific training, for example braille literacy and numeracy, curriculum modification and teaching practices, orientation and mobility, low vision, tactile graphics, optical and non-optical aids, technology, assessment and reporting processes. Consultation with government, church and community leaders and current international and local service providers will enhance the participation of key personnel in all districts, will minimise duplication of training programs in certain regions, and will ensure the efficient use of current facilities and community networks. Training programs offered by the international community should include: specific project training programs, sponsorship projects, learning exchange programs, and mentorship programs. Identification of service providers/agencies in the international community who could offer community based rehabilitation and education services. Disability-specific training in current educational and rehabilitation methods for people with vision impairment would be required by an international organization. An example would be the training of Australian Volunteers International (AVI) volunteers by Australian educators and agencies working in the field of vision impairment. The placement of international volunteers with specialist training in districts. This would be organised through the East Timorese government's Division of Social Services, District Education Administrators, and church and community groups. Identification and referral of people with vision impairment by (a) ETEP team, (b) educators and government education and health officials, and (c) catholic and community organizations working in the districts. Training in computer generated production of braille, including use of Portuguese braille translation software and embosser technology. Vehicle for transport of students with vision impairment to and from school. School and office furniture and equipment . Reading material: fiction and non-fiction, including dictionaries and encyclopaedias. Schools in poor and remote villages require blackboard paint to create blackboards. Reading material in braille and large print formats: Indonesian and Tetun books at this stage. Portuguese books once students learn the Portuguese language. Braille writing equipment and aids, including: hand frames/slates and styli, Perkins braillers, braille paper and binders, braille Dymo labellers and Dymo tape. Electronic braille note takers are not recommended at this stage (due to humidity, dust and poor access to electricity). Braille teaching aids: braille Unilock alphabet tiles, swing cells, tactile domino sets. Optical and non-optical aids: magnifiers, monoscopes and telescopes, tilt tables. Small tape recorders (low power models, with batteries), audiocassette tapes, talking books and headphones. Mathematics resources: tactual compass sets, rulers, tape measures and protractors, large print and talking calculators, geometry boards, spur wheels, embossed and printed graph paper, 3-dimensional geometric shapes, abacus, tactual alarm clocks, braille watches. Tactual graphics: map and diagram making kits, tactual drawing kits. Low vision resources: felt-tip pens, writing guides, and bold-lined writing paper. Orientation and mobility aids: canes (adult and children sizes), auditory and tactual mobility aids. Adults and children have minimal access to books of any kind. There is a need for a public library in Dili and mobile library service for the twelve other districts. A public library in Dili and mobile library service to other districts would enhance levels of literacy, general knowledge and education. Books would be required in the languages of Portuguese, Indonesian, Tetun and English. Library catalogues should include books in braille and large print formats, as well as talking (audio) books. The two-week period of the ICEVI project involved travel to three districts in East Timor. The project objective of conducting a needs analysis of services for children who are blind or vision impaired was achieved, with thanks to the many people who contributed their knowledge and ideas. The objective of obtaining demographic information was achieved with thanks to the ETEP team and staff or Timor Aid/Just World Partners (UK). The model and recommendations presented in this report represent a starting point for the provision of education support and services in East Timor, and highlight the importance of commitment and involvement of the international community. During my two weeks in East Timor, I encountered a society and people rich in culture, where family and community bonds were strong. I would like to express my gratitude to the Australian Eye Care team and Maryknoll Sisters, who welcomed me into their midst as travelling companion and friend. It was a privilege to witness their significant work in East Timor and to experience the gratitude and respect in which they are held by village communities, government and church leaders, and other health care professionals. My strongest memories of East Timor are linked with the miracles of restoration of sight by the ETEP team, and the openness and the realisation that impoverishment on the physical plane does not equate with impoverishment of spirit, community and personal dignity. Hajek, J. and Vital Tilman, A. (2001). Lonely Planet: East Timor phrasebook. Aust: Lonely Planet Publications P/L. McDonald, H. (2002). Insight: Birth of a nation. Sydney Morning Herald, April 18th, 2002.
friends and benefactors. Volume 9 (2). NSW. Ward, T, in collaboration with Das Dores Oliveira, M. and Cunha Marques, L.
(2002). Learning to speak and write Tetun. Published by Mary MacKillop Institute of East Timorese Studies. Attended ETEP clinic at Maryknoll Medical Centre, Aileu town. Assessment of people in Aileu who require spectacles, eye surgery Training provided to families and people who are blind and ineligible for surgery: sighted guide technique, orientation and mobility, and cane use. Canes provided. Assessed vision of people with low vision and gave out magnifiers where appropriate. Journeyed to Fatubosa with ETEP team. Met school principal of Fatubosa School, and teacher and village chief from Kolau village. Worked with people with vision impairment (blind and low vision). Thursday 27th June: Journeyed to Liquidoe with ETEP team. Worked with people with vision impairment (blind and low vision). PM: ETEP Clinic at Liquidoe town. Friday 28th June: Journeyed to Acumao village, Renexio with ETEP team. Visited local school and discussed educational needs. Worked with people with vision impairment (blind and low vision). Saturday 29th June: Attended special religious celebrations in Town of Aileu. Bishop Belo visited Aileu. Sunday 30th June: Travel to Dili via 4-wheel drive vehicle. Accommodation in Dili hospital with ETEP team. AM: Attendance at ETEP clinic, Dili Hospital. Supported assessment process (acuity assessment, provision of spectacles, referrals to ophthalmologists for eye surgery). PM: Met Joanna Meluk de Jesus, Director of Fuan Nabilan, Maureen Magee, Fuan Nabilan Project Officer, and Patricia Wood-Croft Lee, BCA/RBS/RVIB Steering Committee. AM: Attendance at ETEP clinic, Dili Hospital. PM: Visited Fuan Nabilan premises. Discussion of Fuan Nabilan aims and objectives. Handover of Perkins brailler to Fuan Nabilan Director. Brief training session on beginning Braille literacy. PM: Fuan Nabilan staff and students given introductory O&M training byTahir Ali, Mobility Instructor, Guide Dogs Queensland. Travel to town of Same, District of Maunfahe with Fuan Nabilan staff and Patricia Woodcroft-Lee. Inspection of site of planned Fuan Nabilan Rehabilitation/Independent Living community-based residential training centre. Attended Fuan Nabilan meetings with Government Administrator, District Education Administrator, and District Health Administrator regrading proposed rehabilitation/independent living centre. Attendance at Dili District Workshop of Division of Labour and Social Services. Theme: National Disability Policy Development and Community Awareness Raising of Disability, held at International University, Liceu. The inner region of East Timor is mountainous. Roads are narrow and windy, with many parts unsealed and single lane only. Four-wheel drive vehicles are required. Travel distances between destinations should therefore be considered in time, rather than kilometres or miles. Travel time from Dili to Aileu central township is approximately two hours. Travel time from Dili to town of Same, District of Manufahi is approximately five hours. provides the following recommendation to Mrs Frances Gentle, Vision Services. The person concerned worked in cooperation with our Foundation, Fuan Nabilan Ba Matan Aat, during her stay in Dili and the District of Maun Fahe (Sam?). It is the view of Fuan Nabilan that we need very much to continue the cooperation between Mrs Frances, an eye specialist, and our Foundation. We are therefore giving her this recommendation to use as she sees fit. For her goodwill and cooperation we extend our heartfelt thanks. NB: With this recommendation we, Fuan Nabilan, authorize Mrs Frances to seek funding for the needs of Fuan Nabilan. We are currently refurbishing an ex-BRIMOB (Indonesian army) house for use as a temporary office. This means we must seek funding to build another building for use as a school and office. For construction of this building we would need funding of US$20,000.